An even humbler beginning for our little hero. Who's that bozo in the hat, you might ask? Why, that's Bomberman! Yep, before he became the familiar white and blue robot we all know and love today (that look that wouldn't be introduced until a year later, in Lode Runner of all places), Bomberman was just an average human in a garish wardrobe. 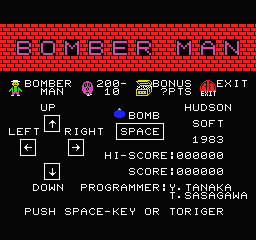 Ignoring his fashion sense, this is most definitely a Bomberman game and establishes the fundamentals that'd keep the series running for nearly thirty years: Run around a single-screen maze, destroy the evil balloon monsters, and find the hidden exit door by destroying soft blocks.